The new material can be used to create synthetic skin and deliver drugs. Engineers at MIT have discovered a new technique to prevent hydrogels from dehydrating that could lead to longer-lasting contact lenses, stretchy microfluidic devices, flexible bioelectronics, and even artificial skin. Researchers found that coating hydrogels with a thin elastomer layer provided a water-trapping barrier that kept the hydrogel moist, flexible, and robust. The inspiration for the technique was none other than human skin, which is composed of an outer epidermis layer bonded to an underlying dermis layer. The epidermis acts as a shield, protecting the dermis and its network of nerves and capillaries, as well as the rest of the body’s muscles and organs, from drying out. “We hope this work will pave the way to synthetic skin, or even robots with very soft, flexible skin with biological functions,” says research lead Xuanhe Zhao. 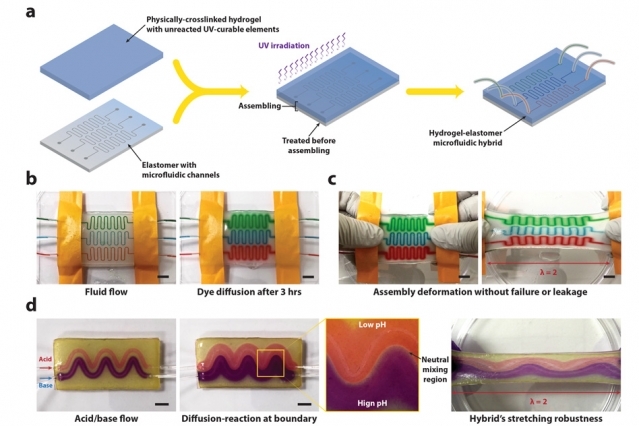 The team is also testing the hybrid-elastomer material to determine if it can be used as a stretchy microfluidic bandage to deliver drugs directly through the skin. The hybrid material also has a potential to be used as a complex ionic circuit. A neural network is such a circuit; nerves in the skin send ions back and forth to signal sensations such as heat and pain. Next, researchers plan to test the hybrid material’s potential in a number of applications, including wearable electronics and on-demand drug-delivering bandages, as well as nondrying, circuit-embedded contact lenses.